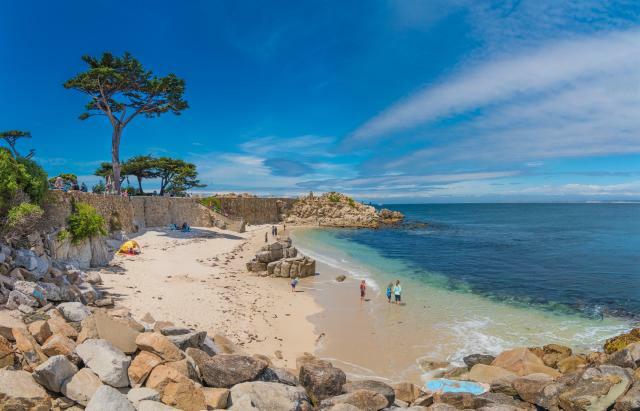 Whether you’re overnighting at one of Pacific Grove’s iconic bed and breakfast inns, or driving in to town just for the day, Lovers Point Park is the perfect place to begin a spectacular autumn walk along the Monterey Bay. Begin a comfortable 4-mile loop to Custom House Plaza by parking and walking down to the Lovers Point Beach Cafe below the Beach House restaurant. Grab a fresh hot coffee or a latte and prepare to head east along the well-maintained Monterey Bay Recreation Trail. If you’re a fan of the HBO series Big Little Lies, you will recognize the park as one of the locations used in season 2. The structure for the scene was dismantled but there’s no mistaking the beautiful Cypress trees and surrounding vistas. Whether you venture out onto the rocky outcrop to look out to sea or just take in the panoramic view from the serpentine rock wall above the cove, on a clear fall morning, there is no finer view of the bay. 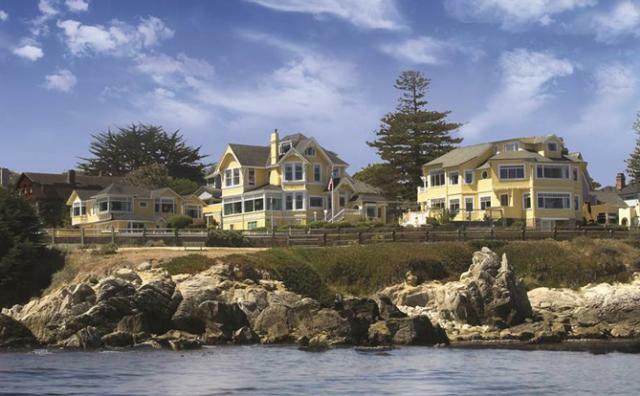 As you set out along the trail east, be sure to look both to your left and right as you walk along, you’ll see grand and beautifully restored Victorian homes on one side and breaching whales and sea otters on the other. Pause as you go along and spend a moment or two looking straight out to sea; often times the critters will come and go quickly and you’ll miss them if you don’t take your time. Just as the trail heads inland at Point Cabrillo, you will pass a beach adjacent to Hopkins Marine Station. 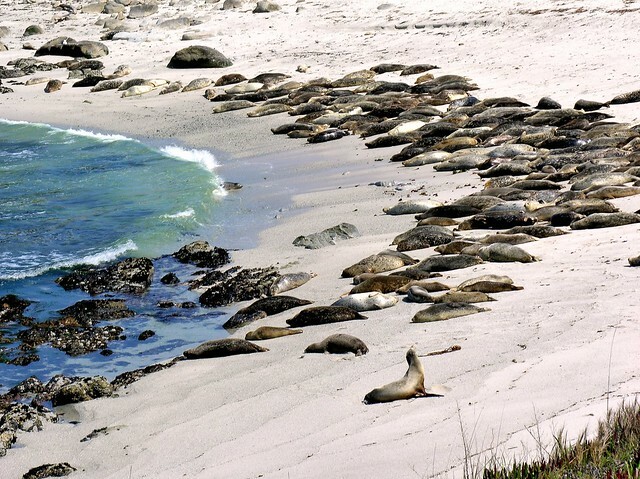 This unique spot is where seals annually haul ashore, give birth and raise their pups. During pupping season, there is a volunteer stationed along this portion of the trail to let you look through a telescopic lens. If you’re lucky you might actually see a birth take place. Other species to be seen all along this stretch of the trail are, oyster catchers, seals, sea otters, orcas, breaching whales, ospreys, sharp shinned hawks, heron, egrets and of course the common gull. The one-mile mark is ahead at the Monterey Bay Aquarium marking the way to historic Cannery Row. 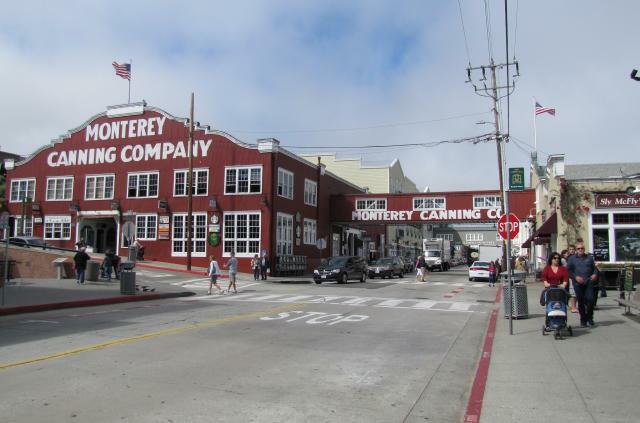 This was at one time a bustling center for the fishing industry chronicled in John Steinbeck’s book Cannery Row. Here the trail takes you through a corridor of both old and new buildings, murals and open views of the water at Hoffman, Drake and Prescott avenues. Additionally, you will be able to peek through to Cannery Row which runs parallel to the trail and catch glimpses of Doc Ricketts lab and artfully restored cannery worker housing. If you are too pooped to walk the remaining half mile to the Customs House, you can always rent a pedal driven vehicle at Adventures by the Sea and continue the last leg of the journey on a bike. Passing the Coast Guard pier and San Carlos Beach, a popular scuba diving destination, the trail curves along the bay following the tracks of the old Southern Pacific Railway. Just ahead, set into the boat filled harbor is Monterey Fisherman’s Wharf. Built in 1870 the wharf was once the bustling shipping center of early California. Goods brought in by sea were accessed at the historic Custom House and taxed accordingly. Currently the wharf is an elaborate and colorful mix of history and modern-day adventure. Not just about salt water taffy, clam chowder and penny pressing machines; there is no better place for freshly caught local fish or whale watching tours than the modern-day wharf. 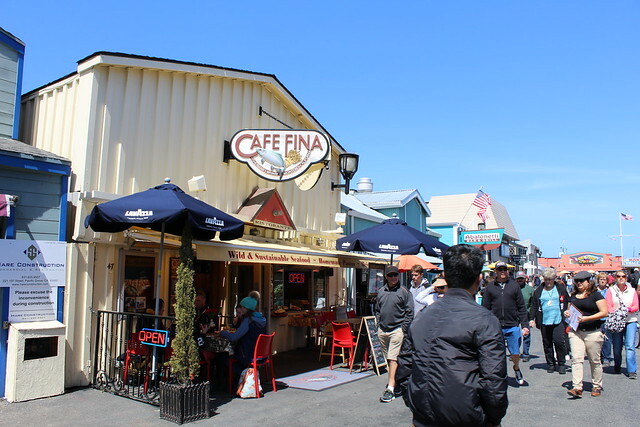 Before you circle back towards Pacific Grove be sure to rest and spend some time having lunch at Café Fina or its sister restaurant, Domenico’s on the Wharf. Owned by a local fishing family you will be pleased with their incredibly fresh seafood offerings. If not all of your group are in the mood for fish, classic Italian cuisine is yet another specialty utilizing family recipes handed down through the generations. 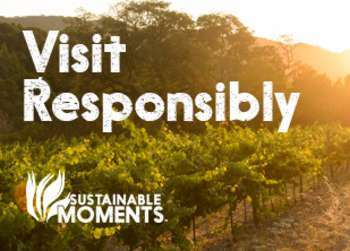 From seafood paella and fresh salmon to wood-fired pizzas, they are the perfect intermission during a beautiful walk! As you walk off the wharf notice the large marker in the center of the trail commemorating Sloat’s landing. 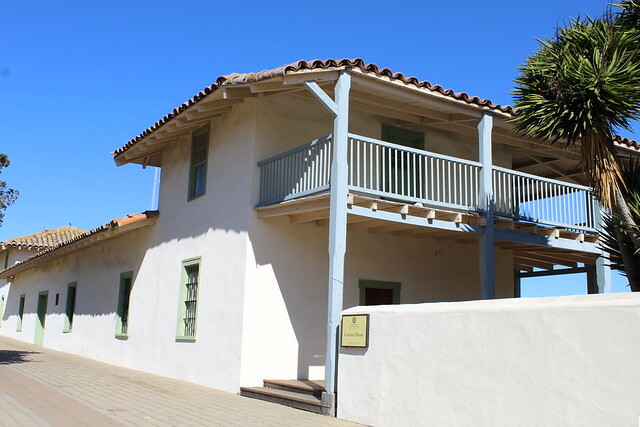 It was at this spot, on July 7th in 1846 that Commodore John Drake Sloat came ashore with 250 Marines and soldiers, and planted the flag of the United States on Mexican occupied California soil. Not a shot was fired as they proceeded to occupy the town and lead California to eventual statehood. If it’s open on the day of your walk, be sure and step inside the wonderful Custom House Building and other early California buildings in the plaza surrounding it. Well-fed and rested, head back west along the Recreation Trail retracing you steps towards Lovers Point. 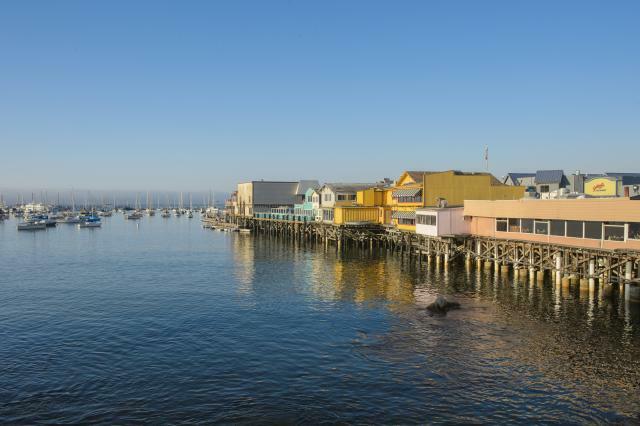 Veer off the trail to the right at the Coast Guard pier and walk along Cannery Row proper. Along this route you will see where the old canneries once stood and imagine the sights and sounds of the days when sardines were plentiful. A few old rusted boilers still remain along the way and if you have read your Steinbeck, you can almost imagine how it would have looked when he and Doc Rickets prowled the row. 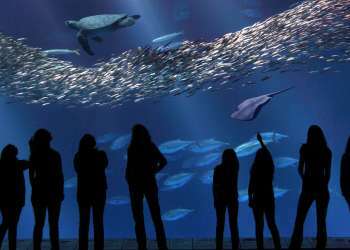 The road turns up at the Monterey Bay Aquarium and joins the Recreation Trail again. Follow it to the right for another mile or so and you will be back at Lovers Point Park where the walk began. Fall on the Monterey Bay Recreation Trail, is truly a magical time. Whether you experience the cool greys of a foggy day or the crisp and clear blues and greens of autumn sunshine, the beautiful scenery and historical settings, make for a fabulous and truly enjoyable walk that won’t soon be forgotten!